Arpita and Aayush got married in November 2014. The marriage ceremony was a very lavish. It took place in Falaknuma Palace situated in Hyderabad. Arbaaz Khan revealed the Arpita’s pregnancy news for the first time in September 2015. 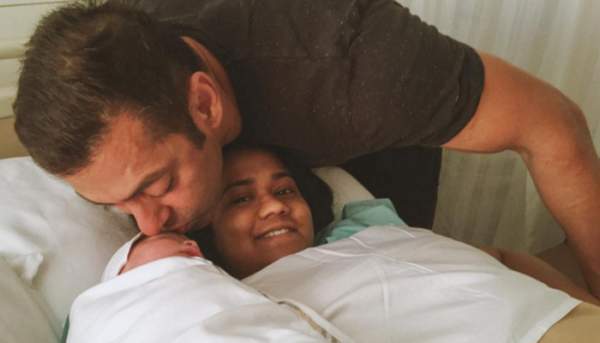 The couple has named their son – Ahil. Now, Salman Khan has become ‘Mama’. The wait has been over. He visited the hospital to see his newborn ‘bhanja’ and sister. The mother and baby both are healthy. Meanwhile, Salman is busy for the shooting of ‘Sultan’. He is known for tremendous love towards children. He couldn’t stop himself after hearing the good news that Arpita has delivered a child. Pulkit Samrat, ‘Sanam Re’ fame actor wished the Khan family on Twitter by posting a tweet to them. He has been close to them for quite some time now.